I hear so many reasons why people don’t get organised. “I can organise it LATER”. How much of your time is wasted looking for items like keys, important papers, lists, phones, shoes? Lets do a little exercise. Lets say you spend 5 minutes a day looking for items that aren’t in their right place (now for some of you I’m sure thats underrated). That equates to 30 hours a year, thats 76 days in your life wasted looking for things. How much time is spent cleaning up your things? If you had less crockery, less toys, less clothes, less stuff – it would take you less time each week to clean them. Some people tell me that it costs to much to get a professional in to help them get organised. I can appreciate that to an extent. I would like you to think about the money wasted on just overdue fees from late returns of DVD/ library books or bills that are not paid on time. Have a think about the number of things you have bought as replacements just because you couldn’t locate the original – diary, socks, drink bottles and lunch boxes, hair accessories, sunglasses, dog leads and more. How much money has been wasted? 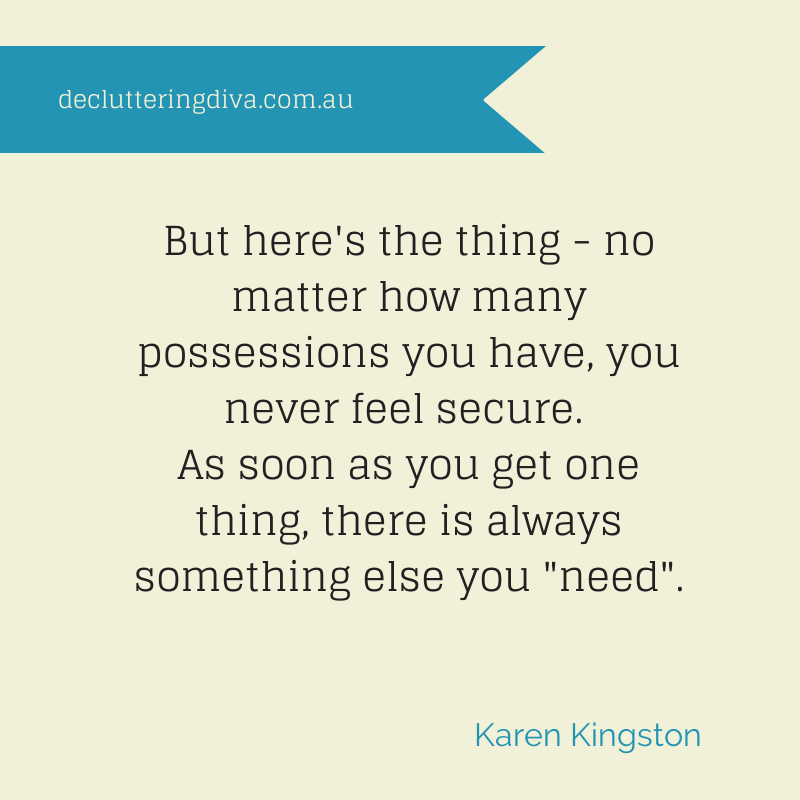 When decluttering some clients homes I have found money and gift cards worth $1000s amongst all the clutter. How much can you really value your money if you treat it like that? I worked with one client whose main motivation was to declutter so it was safe for her granddaughter to visit. She wasn’t able to have family gatherings, entertain friends or babysit as the clutter was choking her space. It was more than just making the space nice to look at, it was making the space safe. When you can’t have friends or family over due to the lack of space or embarrassment of your clutter, that is hurting. It can hurt relationships, it is hurting your self esteem and respect, it will hurt the opportunity for future relationships. Many of the items that fill our homes are useful. The question to ask is, are they used? We store so many things just in case we may need it. How many pieces of two by four, spare tiles or other random hardware are stored in your garage or shed just in case? We accumulate items that we did not choose out of respect for the person who handed it to us. Just because Aunt Liv gave you her old couch, lamp or baking dish doesn’t mean you have to keep it. Many of us fall victim to the trap of buying far too many items that we “need” just because they were on sale. The list of possibly useful but unused items goes on. I have done some research on the physical cost of storing these seldom used items. Lets say these “I may need it but never use” items filled half a garage – offsite storage costs for this would be around $350 a month! But of course, you are not silly enough to go and waste your precious money on extra storage. But most of you are! According to the ABS the average mortgage in Australia is around $2000 a month and I estimate that one eighth of your space is dedicated to storing stuff – thats $3000 a year spent on storage!!! That’s a family holiday. There is a common saying that clutter is just postponed decisions. There is always later. But what is waiting costing you? The delayed decisions are costing you precious time, money, relationships, happiness and more. Previous PostA simple life…Next PostYou won’t believe what’s hiding inside EVERY Australian Home!